Although lacking in popularity, it appears that automated appraisals have obtained their intended results. Urban Institute (UI) researchers Laurie Goodman and Jun Zhu found the changes have helped to lower default rates. They suggest that, in turn, some lender processes and potentially pricing should be changed as well. Purchase mortgages, used to buy a home. Rate and term refinance mortgages, used to reduce the interest rate or extend the length of an existing mortgage. Cash-out refinance mortgages, which are obtained when a homeowner wants to tap the equity that has accrued in their home. It has been assumed, based on loan characteristics like loan to value (LTV) ratios, debt-to-income (DTI) ratios and FICO scores, that rate and term mortgages carried the least risk and that purchase and cash-out refinances would default at about the same rates. However, an earlier study by UI found that actual performance of the loan types did not match the assumptions. 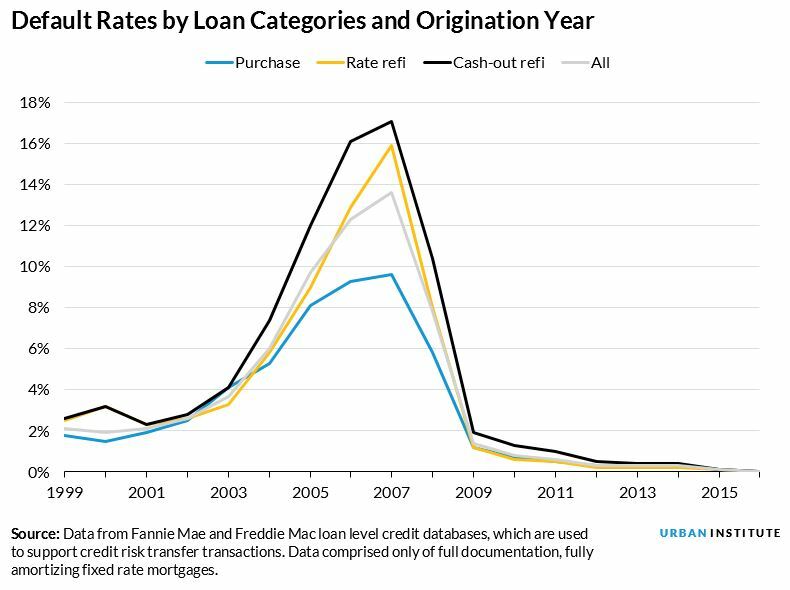 In reality, purchase mortgages defaulted the least, followed by rate and term refis, and then cash-out refis, which defaulted the most. There was a pervasive belief that appraisal bias, especially towards no-transaction refinances, contributed significantly to the housing crisis. That lead to greater scrutiny and a significant re-evaluation of the appraisal process. Freddie Mac and Fannie Mae (the GSEs) have adopted automated valuation models (AVMs) which use mathematical modeling, drawing on a huge database of recent transactions complete with property characteristics, to generate an estimated sales price. Goodman and Zhu say this has made for more accurate appraisals. The AVMs have enabled Fannie Mae and Freddie Mac to share concerns with lenders about an appraisal prior to the execution of a mortgage, allowing the lender to take corrective action. The authors write in UI's Urban Wire blog that these developments were predicted to decrease the expected default rate on all refinanced mortgages, which were particularly susceptible to appraisal fraud. The data reveals that this has indeed been the case. The industry's risk assessment and management abilities have improved overall and, accordingly, have decreased the expected default rate on all mortgages. While purchase mortgages are still the least risky and cash-out refinances default with the greatest frequency the differential has been narrowing. That, the authors say, is exactly what should be expected, as appraisals have become more reliable, AVM models have improved, LTV ratios have become more accurate, and the default differentials have narrowed. They used regression analyses to examine the difference in risk characteristics inn loan originated between 2000 to 2009 and the 2010 to 2017 vintages. They controlled for factors that could drive defaults, i.e. LTVs, DTIs, FICO scores, interest rates, loan balances, and indicators for single-family, owner-occupied, and issue years. They also included indicators for rate and term refinances and for cash out refinances. Purchase loans served as the reference category. The rate and term refinances were 51 percent riskier than purchase loans in the first period but only 11 percent riskier for more recent loans. Cash-out refinances were 96 percent riskier in the first instance and 55 percent riskier in the second. In other words, while the loan characteristics still suggested that cash-out refinance mortgages would be the riskiest and purchase mortgages the least risky, the relative risk of the loans had narrowed. The GSEs and FHA use their proprietary automatic underwriting systems to decide which loans to approve using model-based inputs on the riskiness of a given set of loan characteristics. The authors say that their results suggest that there has been a structural change in the systems which has lowered defaults, especially on refinance loans. While the models used in these underwriting systems are not public, the authors say their results suggest an update and a recalibration may be in order. They also say that knowing the default rates for these loans has implications for the proposed capital standards for the post conservatorship GSEs and implications for pricing in the interim. The capital standards, as they are currently proposed, require a 1.3-times premium for rate and term refinances and a 1.4-times premium for cash-out refinances. They suggest that the cash-out refinance premium may be fair or a bit low and that the rate and term premium is too high.